GC Recaldent Products; Melbourne University discovered the compound CCP-ACP, which mimics the building blocks of tooth enamel. We use this compound in toothpaste and chewing gum to mineralise teeth after they have had acid attack from foods and drinks. "Since I have been using it my teeth have strengthened and are far less sensitive. My dentist has told me that my teeth are a couple of shades whiter." Developed at Melbourne University. Recaldent Gum is the perfect addition to GC Tooth Mousse. The CCP-ACP formula helps strengthen teeth by replacing enamel compounds lost during the acid attack of eating. Recaldent Mint Gum is a mint flavoured chewing gum that comes in tubs of 112 pellets. This gum contains the active CPP-ACP which enables remineralisation of teeth that are subject to acid attack from the foods we eat every day. Recaldent also contains Xylitol, which is a natural sweetener shown to help control mouth bacteria and improve saliva quality. Saliva is your body's natural oral defence system. Recaldent contains 10% Calcium Phosphopeptide - Amorphous Calcium Phosphate (CPP-ACP). When applied in the mouth CPP-ACP binds to the tooth, and plaque and soft tissue surfaces localising calcium, phosphate and fluoride. Saliva will enhance the effectiveness of CPP-ACP and the flavour will help stimulate saliva flow. The longer CPP-ACP and saliva are maintained in the mouth, the more effective the result. 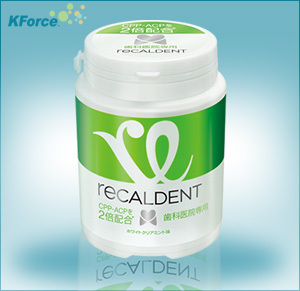 Recaldent Tooth Mousse provides extra protection for teeth. It helps to neutralise acid challenges from acidogenic bacteria in plaque. It helps to neutralise acid challenges from other internal and external acid sources. 2,720 students chewed sugar-free gum three times a day for two years. The study found that subjects who chewed Recaldent Gum had significantly lower rates of dental decay progression on their teeth than those who chewed a standard sugar-free gum. The CPP-ACP (casein phosphopeptide-amorphous calcium phosphate) complex used in Recaldent was developed by Professor Eric Reynolds and his research team in the School of Dental Science at The University of Melbourne. The complex is derived from peptides isolated from the milk protein casein, complex with calcium and phosphate, and has been found to be effective at replacing lost minerals – or remineralizing – decay-damaged teeth. This trial sought to measure any caries (dental decay) preventive effect of chewing sugar-free gum containing the CPP-ACP complex (Recaldent), when compared to a standard sugar free chewing gum. The progression or regression of caries over the course of the study was measured by dentists using visual-tactile examinations and digital bitewing radiographs. All radiographic images were examined and scored by a single dentist in a dedicated room with controlled light level and monitor settings. The trial results found that chewing Recaldent gum provided an increased preventive effect beyond that achieved through good, basic oral care habits and chewing sugar-free gum. The results confirm the findings of short-term in situ remineralisation studies, and demonstrate the long-term outcomes of regular exposure of teeth to the CPP-ACP complex. The conclusion of the clinical trial was that chewing Recaldent can be regarded as an additional caries prevention tool, over and above other accepted preventive strategies such as water fluoridation and the use of fluoridated toothpaste. For subjects chewing the Recaldent gum, the odds of a tooth surface experiencing caries progression were 18% less than for subjects chewing the standard sugar-free gum. MV Morgan, GG Adams, DL Bailey, CE Tsao, SL Fischman, EC Reynolds. The Anticariogenic Effect of Sugar-Free Gum Containing CPP-ACP Nanocomplexes on Approximal Caries Determined Using Digital Bitewing Radiography in Caries Research, 42:171-184 (2008). Artificial Sweetener; (Xylitol, Malitol, Mannitol (421), Aspartame(951), Acesulfame K), Gum Base, Flavourings, Gum Arabic, CPP-ACP (Casein Phophopeptide-Amorphous Calcium Phosphate (derived from Milk), Hydrogenated Starch Hydrosate, Citric Acid, Emulsifier (Soy Lecithin), Colours, Vegetable Wax. Tub Size is 112 pellets.